“Ninety-seven percent of executives and managers say their communication to subordinates is clear, understandable, consistent and direct” (NFI Research Survey). If you are reading this and at least chuckling, join the crowd. There are so many things that leaders must be aware of, be doing or learn to do better. Maybe they assume that as long as they are sending emails or telling their organization about the latest change or idea they will pursue that counts as effective communication. Well, it is one form of communication: one-way. After all, they are too busy doing all the other things to worry or care whether their message is received and understood, but they assume it is. 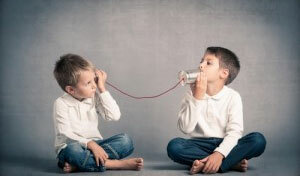 According to this research, the majority think their communication is effective. Yet it is one of the number one complaints or reasons I am asked to work with an organization. Sending email, telling or selling ideas and simply advocating a thought or play does not usually allow for a response, acknowledgement or any way of knowing if the person on the other end of the message actually got the message and understood it. What if there is some action that must be taken as a result of sending the communication? Perhaps leaders ‘assume’ they have communicated because no one tells them otherwise. Guess what happens in this scenario? Communication breaks down!!! There may be confusion, missed deadlines, incomplete tasks, unanswered questions and so on. There are so many barriers to effective communication (e.g. emotions, attitude, knowledge, etc) that can compound the problem. Not to mention the medium used to communicate that adds its own complexity (e.g. email, social media, text, etc). Remember the childhood game ‘pass the message’? It is often used as an example to help understand the communication process and where it breaks down. If leaders can keep that in mind, even when sending an email to an entire organization, they will realize that what appears to be a clear and concise message can be interpreted by the receiver in many different ways. Why does this happen? The sender and receiver of the message each have their own ‘frame of reference’ or what Peter Senge calls our ‘mental models’. Some people refer to these as our filters – the way we sift whatever information we receive according to our own beliefs, experiences, values, assumptions, feelings and many other factors. That gives us a way to focus and try to understand what we want to say or how we understand what we heard. If the sender has a different ‘frame of reference’ than the receiver, there is already a mismatch and possible breakdown in communication. Leaders can learn how to slow down their thinking, reduce their assumptions and challenge their own frame of reference to improve their communication. In order to really know if their communication is effective, they need to ask the receiver if they understand – receive some type of acknowledgement. Rather than spending their time ‘telling and selling’ – shift into using questions. Not only will it uncover if your message has been understood, it will invite others into the conversation and find out what they are really thinking or what ideas they have to offer. Want to improve employee engagement? Ask people what they think, what suggestions they have for improvement, and then acknowledge you heard them and will take action. Worried about how it looks if a leader asks questions? Next month we will explore that more and see how a shift from being the expert as the leader is an improvement to communication and business results. Resource: If you want to improve organizational communication, contact us for a free consultation!